Design professionals can locate an AIA lunch and learn with our provider quick list below. 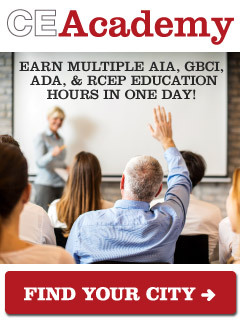 The AIA lunch and learns are provided free of charge to AEC firms. The AIA lunch and learn providers typically offer lunch for free. The AIA lunch and learns are provided by building product manufacturers, trade associations, and non-profits. The AIA presentations are delivered by the AIA lunch and learn course sponsors below, not the Ron Blank company. Please submit a lunch and learn request to educate your team.